Earlier this week I saw a video that was showing how some guys made some really cool bullet time effects with 15 tiny rugged awesome cameras called “GoPros”(that wasn’t a paid endorsement, they’re awesome). 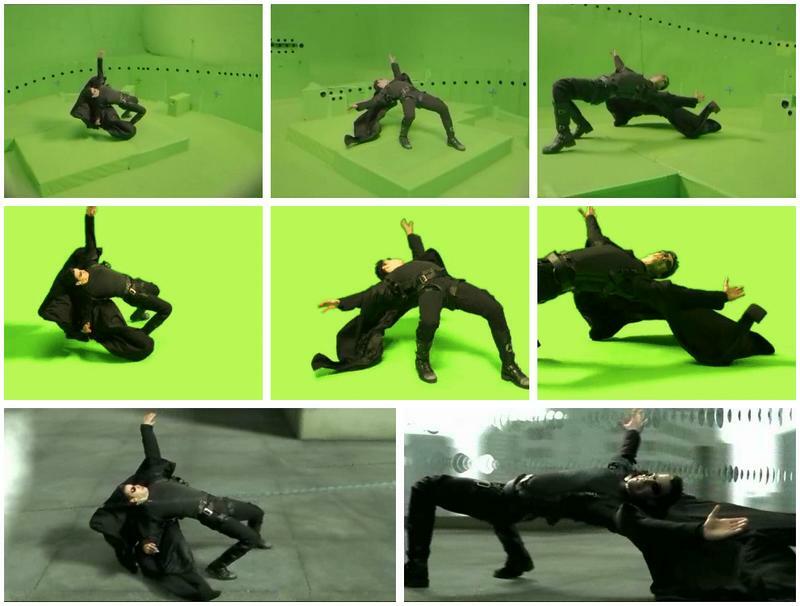 For those unfamiliar, the bullet time effect gained popularity from the first matrix movie. The footage slowed down to slow motion while [Neo] dodged some bullets, but the camera was still able to move around. To do this, they built a massive circular rig and mounted tons of cameras all around. Using these multiple angles, they were able to stitch together the scene in slow motion and “move” the camera. I know that the multiple camera method works, but I also know that many production companies have moved to a new method of using a single high def slow motion camera on a fast and precise robotic arm. They get the cool shot they need and have the flexibility to change the path the camera takes much easier. The only disadvantage here is that you can’t stop time entirely and rotate around the object. I can’t find the video right now, but there was a great one that showed how they could use this industrial arm to move the camera along with pouring wine, or around a drum set. I decided I could easily build a rig to allow me to do a rotating effect during slow motion. I opted to go the easiest quickest route which was simply to mount an arm on a “lazy susan”. I then placed a GoPro Hero3 on the end of the arm, set the recording mode to 120fps and gave it a spin. The faster you spin the arm, the more the effect looks like bullet time. Otherwise, it just looks like a nice rotating movement. The results turned out great, even though the slow motion footage is only in 720p. Some possible future improvements would be to add a platform for things in the middle. I had intended to do this, but the metal I was using flexed too much when extended that far. There is a tiny bit of wobble, some additional weight on the lazy susan might clear that up. oh noes..watch out…Go*ro might send in a C&D letter. haha, I really doubt it. meh, you can call it bullet time all you want, but it’s still a slow mo. When’s the last time you saw a camera mounted to a lazy suzan? This is an original design that’s not typical. It’s a hack. Youtube, years ago. First thing that pops to mind though are basement scenes in That 70’s Show. Anyhow, search to internets and its pretty common. That’s a good idea. But in my point of view this is not the same effect. In the real effect, you can “stop the time” and turn over the action. With this hack you turn over the action WHILE it’s taking place. With a single camera, MATRIX wouldn’t have been so great ! Seems like a simple improvement would be to balance the weight on the opposite end of the arm. That and maybe some extra lube on the Lazy Susan bearings would seem to go a long way. some lube would be nice. Fully cleaning all the glass shards out would probably be a good thing too. Interpolate that data. Excellent use of the pro miniature form. I feel that this may lead to a 360 ring if go pro get in on the action. it also adds some motion blur, so the footage isn’t as crisp. still, it’s a nice result. Something I noticed from watching too many episodes of Time Warp where they use really expensive high speed cameras, is that they use some pretty powerful lighting rigs for the shots because otherwise the footage would come out too dark. Perhaps try shooting the 120fps video under something a bit brighter than a desk lamp? Things like this is the reason why the GF told me to have a fire extinguisher in the kitchen and have to wait till GF and kids are out the house for hacks. Now just get a higher speed camera, and a faster thing to pivot on. Is GoPro owned by Apple? Or are they just using Apple’s business model of bullying everyone they don’t like? their twitter says it is a misunderstanding. Dang!!! That’s over $3000 in cameras. Think you guys could do a roundup on some cool GoPro hacks? Not sure what all is out there, but I’ve seen some lens conversions with some impressive results. Nice, though mounting a bike wheel horizontally would’ve been smoother and not slowed due to friction like the lazy susan. The other problem is 120fps out of the gopro is crap. It’s not real 120fps is intrpolated by shooting at 120Fps interlaced and then blending the frames… IF he had a real progressive 120Fps camera it would look a LOT better. Maybe the GoPro4 will be a real 120fps camera. I think the reason this turned out poorly is that your method for “authoring” the shot was to swing the rig with one hand and then start to pour. If you actually had a plan for what you wanted to do with the camera, you could computer control the rig to run an animation. The point would be that the rig could accelerate to insane speeds to and precise location to seemingly be in two place at once or to stop time. You could then slow the footage back down to a more viewable speed and the world will seem to have stood still. Well that’s the theory at least. Infinitely high speeds and motion blur are going to be inhibiting. The difference is that with Bullet Time, you are able to change the perspective of the camera with the object frozen in time. You can’t do that with the method presented with this post. Why not add a little DC motor on that thing to get get going and keep it at a steady pace. that would be good! I was going for fast and simple, but that would work. Especially if you did a belt drive onto a bike wheel, like someone else mentioned. I’m confused, why not add a motor? Use a cordless drill or something for a quick way to get such. I would need to experiment with this, but my thoughts on this were that what is needed for the full effect was a perfectly synchronized movement and strobe light. At 120fps, that’s 1 frame per 8.3ms. That’s actually quite a bit of time between frames. With a rig that could move it’s entire distance in between a frame, you would be able to stop time. But to prevent motion blur, the camera would have to be synced with the movement and the light source being synced with the camera would also help with motion blur. Something like increasing the brightness to max every 8.3ms. Does the GoPro have a sync output (genlock)? Remember that the 8.3ms in between frames is ‘lost time’ so just like stop-motion animation, you can move things around in between frames and the effect is magic. In fact, I believe that is pretty much how the actual rig worked. They weren’t movie cameras but a string of still cameras synchronized. Hmm, might have to experiment with this. No, you’re wrong. Those 8.3ms is exposure time. If you move, you’re going to blur your pixels because they will be exposed by different ray of the scene. If order to do what you say, you have to provide a very powerful strobe light so the exposure time can be set to something very very low (like 100µs or less), and still get as much light as it gets in continuous lightning of 8.3ms, and you must not move during that short time (obviously). Since you can’t fix the exposure time on a GoPro, you’re out of luck with such a camera (or you’ll have to provide a mechanical shutter at 120Hz, but again, it’s not in the low cost hack anymore).